I miss the old days of blogging when I can just jumble up a few non-related subjects together to form a blog post title, and still make perfect sense. Those were the days before I even ventured so deeply into photography. Last weekend, there was the International Kuala Lumpur Book Festival happening at MAEPS, Serdang, and I braved the public transport (LRT --> KTM --> Shuttle Bus) to the event venue, just for two specific reasons: 1) to buy the new book "Cerpen-Cerpen Underground" authored by Saharil Hasrin Sanin, a renown local Malaysian author and visual artist, and 2) to meet Saharil in person during book signing session and of course, to have the newly purchased book signed by him. So who is Saharil? 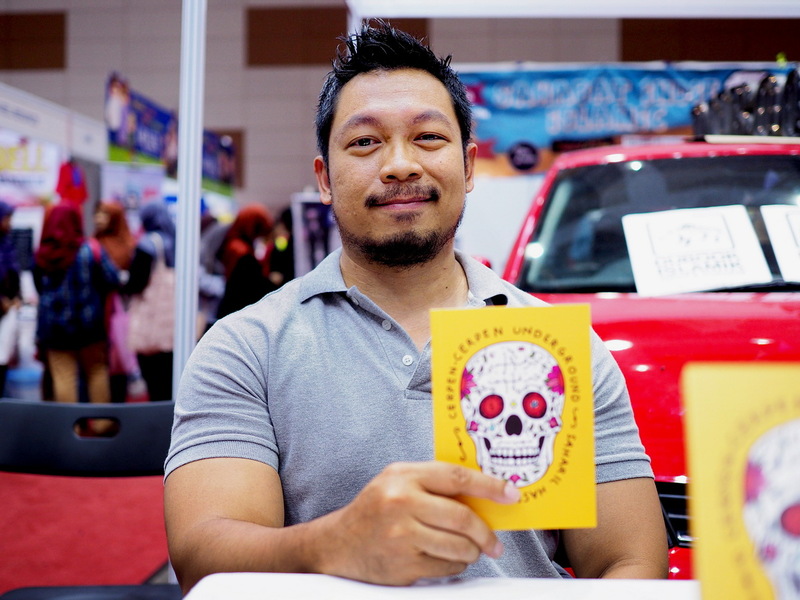 Those who are familiar with and following local Malaysian literature scene will surely know of Saharil and his work. Not too dissimilar to myself Saharil too was an engineering graduate, but was gravitated toward the world of art, in his case, writing and drawing. I first discovered him through his online blog many years ago showcasing comic style drawings, which he updated every day (the blog no longer exists). Then I read some of his short stories and immediately fell in love with his style of writing as well as his unusually unique perspective on life. I particularly admire the way he sees the world around him, and how his interpretation is always surrounded by layers and layers of deeper meaningful messages. Through his writing and visual arts, I have been inspired to train my eyes to look at everything around me differently, and in some ways Saharil has influenced my style of photography. 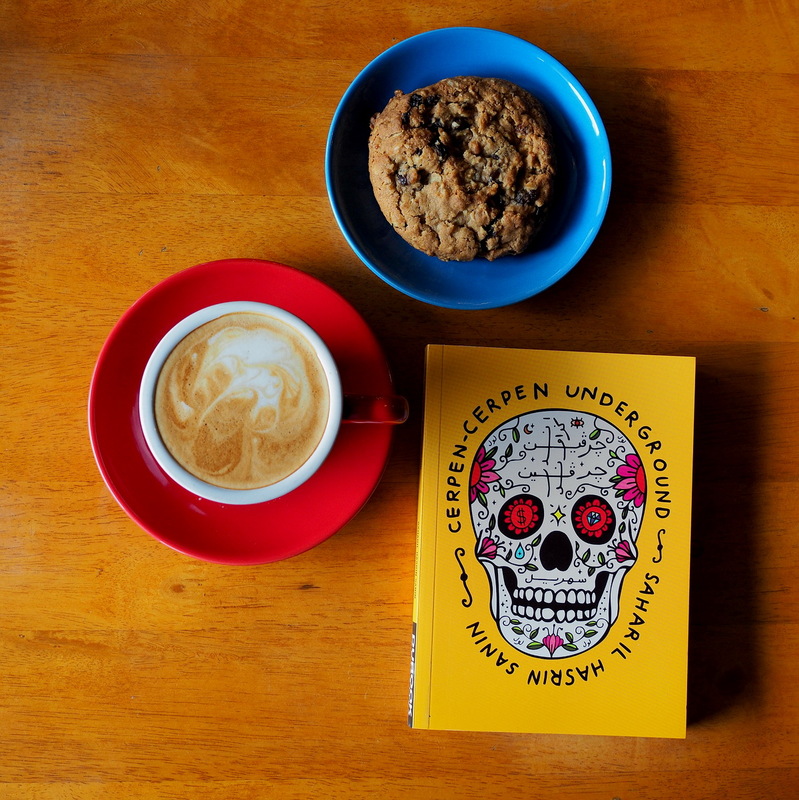 I am probably not qualified to do a review for his new book, "Cerpen-Cerpen Underground" (translated as Underground Short Stories), and the book is fully writen in Malay Language. My mastery of Malay Language has been deteriorating over the years as I rarely use this language any more, but gosh, reading his new book made me fall in love with Malay Language all over again. I am only about 30% through the book currently (believe me I would love to finish the book in one seating but who has the time to do that these days? I did not even have sufficient time for shutter therapy) and I am loving it so far. If you are a Malaysian, and you appreciate the beauty and grace of the Malay Language, this book "Cerpen-Cerpen Underground" by Saharil Hasrin Sanin is highly recommended for you. You can buy the book online here, and it is priced at RM25 only! A super quick portrait of Saharil. To Saharil, thank you so much for what you do, you have brought much laughter and even tears (yes, some of his writings/art pieces are indeed that moving) to some of us, and I appreciate your generosity in sharing your craft with us. Stay awesome always. I don't read Malaysian, but I like his cover. He created the cover art himself! The cover is reminiscent of the album cover of James' La Petit Mort album. Good photography, as always, Robin. Thank you for sharing your thougts. It's not only photography your blog readers are interested in, it's you and the way you live "over there" in Malaysa. Lot's of fun with the book from the "other side of the planet". Thanks Armin! I always find inspiration to shoot from unusual sources, so I thought maybe some of my readers would be interested to know where these sources come from. I was told by a friend that to progress further in art I must also consider other forms of art other than photography itself! In years past, I had been in contact with a number of Malaysians. We didn't use Bahasa Melayu too often, but when it happened, it was interesting to watch the progression from Indonesian to Malaysian to Tagalog in The Philippines. I see a lot of English in Malay, but it is few languages that don't borrow words. There is much English and German in Japanese, and English is hardly pure. I find it valuable to understand you more when you do include hobbies outside of photography. I also agree with you that lighting in some of these buildings is horrific and trying to get the white balance correct is like getting cats to line up for a photograph. Thanks! I used to blog a lot more about random things that happen around my life, not just exclusively photography. And also, we are supposed to carry around a camera with us wherever we go to!